Liver transplant, also known as the hepatic transplant, is a major surgery during which damaged or ill-functioning liver is replaced with a health liver donated by someone. It is a tedious procedure that demands time, patients and expertise. Approximate cost for pre liver transplant investigations, Surgery & post liver transplant follow up would be around 36000 USD for adults. Approximate cost for pre liver transplant investigations, Surgery & post liver transplant follow up would be around 32000 – 36000 USD for paediatric patients. Liver is an important organ in the human body. It helps break town toxic substances in the body, plays an important role in processing fats, carbohydrates and proteins and also helps with blood clotting production of bile. Liver transplantation in India is a common procedure and is conducted at a number of world-class hospitals located across different cities, including Delhi, Mumbai, Goa, Bangalore, Hyderabad and Chennai. Liver transplant cost in India is highly affordable as compared to other developed countries. It is a tedious procedure that costs a fortune. However, in a country like India, this procedure is still affordable. On an average, the transplant may cost around $32000 in India. This package is inclusive of the boarding, surgery, lodging, nursing, food, surgeon, transportation, recovery, anesthesia, lab test and rehabilitation costs. The same procedure may cost three or four times more in other countries. India is one of the most popular medical tourism hubs for a number of reasons. Different procedures are carried out by experienced doctors in the country and liver transplant is one of them. The reason why medical tourists prefer to visit India for this procedure includes low cost, world-class facilities, high specialized medical staff, use of latest technology and personalized care. The quality of medical care offered at liver transplant hospitals in India can be compared to any other hospital from any of the developed countries, including the US and the UK. When is liver transplant conducted? Liver transplant is conducted in the case of end-stage liver disease (alcoholic cirrhosis, sclerosis, chronic hepatitis) and acute liver failure. It is also conducted in the case of liver cancer and genetic liver diseases. The presence of viral hepatitis may also warrant the need of conducting a transplant. Who can undergo liver transplant in India? Patients with an irreversible damage to the liver, chronic liver disease or liver failure are suitable candidates for liver transplant. A surgeon decides to conduct transplant only if the patient is physically, emotionally and psychologically fit to undergo it, and if the patient would benefit from the surgery and the procedure would do more good than harm. People with AIDS, severe active infection, irreversible brain dysfunction, alcoholic liver disease, metastatic cancer or advanced heart or lung disease are restricted from undergoing this procedure. From where is the transplanted liver taken? The liver from transplant is taken either from a deceased donor or a living donor, who is typically a close family member of a friend. What happens before liver transplant? A doctor carried out a preliminary examination before the surgery. This helps the team decides whether the liver transplant is a viable option or not, or whether it should actually be conducted. The team of investigators comprise the surgeons and a hepatologist. What happens during liver transplant? Typically, liver transplant procedure may last for a period of six to eight hours and it is performed under the influence of general anaesthesia. Prior to the surgery, a pipe is put into the mouth of the patient to help him or her breathe during the surgery. Next, an incision is made into the abdomen of the patient to remove the damaged organ and replace it with the donated liver. The donated liver is attached to the bile ducts and the major blood vessels during the surgery before closing the incision. 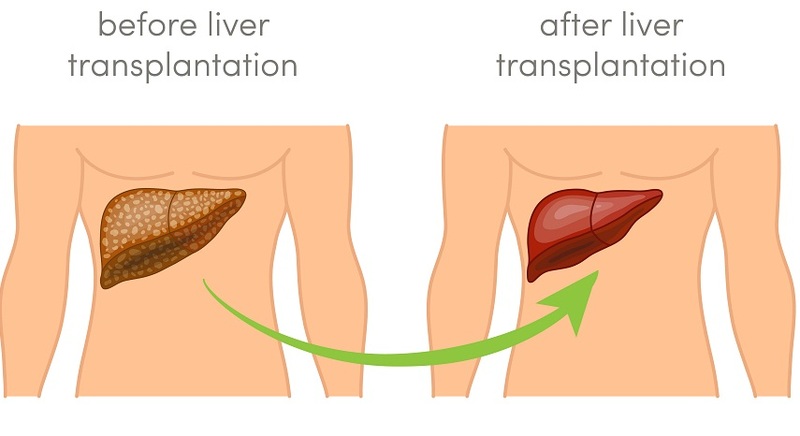 Reduced-size transplantation: This type of procedure is mostly conducted in children and involves transplantation of only a part of the donated liver. This is usually conducted when 20 percent of the original liver is still intact. Hetetropic transplantation: This type of surgery involves the transplantation of the donated liver to some other location than the original liver, which is left as is in its original location. However, the transplanted organ is attached close to the original liver. This is conducted in cases where there is hope that the damaged liver may recover. Orthotropic transplantation: This procedure involves complete removal of the damaged liver and its replacement with the donated liver. What happens after liver transplant? The patient is required to visit the surgeon regularly for the next three months after the surgery. Typically, a patient is advised to visit twice a week for follow-up visits and sessions. The doctors may check patient’s recovery during the visits, which can be gradually reduced. Follow-up blood tests and scans may be conducted to check for the recovery. Immunosuppression medicines are prescribed to prevent the body from rejecting the foreign transplanted organ. Patients are advised to lower their intake of salt and reduce a number of calories that they take in a day.